What if your next job was hiding right in front of you? Quick poll: what is the hidden job market? So many jobs are never advertised anywhere, completely unpublished. Those are the hidden jobs. Recently, the hidden job market definition has expanded to also include jobs that are poorly advertised in places where they’re not likely to be seen. Competition for advertised, non-hidden jobs is tougher as more people fight for a smaller number of openings than what are really available. Put differently- if you can find a relevant hidden job opening, you’ll have much fewer candidates to compete with for the position, if any at all. So where are the hidden jobs? Free bonus: Download a PDF version of this article to use as a handy checklist and reference. Download it now. 1) Former bosses, clients and partners – They know better than anyone what you’re capable of professionally, and if they can’t rehire you, they’re well-placed to refer & recommend you to others. 2) Former bosses (2) – in particular, stay in touch with the former bosses with whom you had a great working relationship. It’s common for new managers to bring in their own staff – with whom they’ve had success in the past – as current employees get pushed out. 3) People who've always wanted to work with you – over time, people may have said “if you ever need a job” or “if you'd ever like to work together, let me know”. Now is the time to follow up on those suggestions. 4) Former colleagues – almost as good as former bosses in terms of their knowledge of you, but less likely to be in a position to hire you directly or know someone who can. 5) Friends & family – classic. Send your updated resume to your friends and family and briefly explain what kind(s) of job(s) would be a good match. 6) All your contacts – don’t just ask for job leads. You’re likely to get an even better response rate asking for just one referral to a contact of theirs who can help more. 7) Someone you admire – such as a recent event speaker, an alumnus from your school, even an author whose book you just read. Briefly mention a recent achievement and ask if they can make one suggestion about where to look next. 8) Talk with anyone & everyone – a friend told me she found her last job by chatting with a stranger at her table at a recent wedding. 9) Placement or recruitment agencies – contact the ones that specialize in your industry. They’re usually paid on commission at or after hiring time, so they’ll keep you in mind if they think you’ll be easy to place, regardless of whether they actually have relevant openings right now. 10) Check in with your alma mater – ask professors, current or former, especially the ones you impressed and/or taught a subject related to your profession. 11) University or college career services – many of them gather information about where each graduate got hired, which you can use to learn about companies that might hire you too. 12) Alumni associations – some actively help place members with other alumni while keeping track of the job seekers. 13) Employer alumni associations, official & unofficial – ex-employees of larger companies often stay in touch as a group. If you’re part of one, use these connections to get help. Or, use them to target the company itself through its former workers. 14) Regional or local newspapers – companies advertise there – and not just in the classifieds – to find someone based nearby. Keep in mind that their job listings don’t always appear both on their website and in their print edition, so check both if possible. 15) Your local library – a good place to find regional and local newspapers, business journals, annual reports, trade magazines, association listings, telephone and business directories. 16) The telephone book – another great place to find local companies in your industry. Depending on how close to home you search, the number of potential, good-fit employers would be small enough that you can target them aggressively. Draw up a list and start researching each one. 17) Local craigslist postings – the obvious thing to do would be to check the ‘gigs’ section, but companies sometimes err and post ads in the resumes sections. 18) Local craigslist discussion forums – look for profession-related questions that employees would typically manage for an employer, respond and leave a job seeker’s signature. 20) Job fairs – typically used for dumping resumes in the laps of company HR reps regardless of whether they have relevant openings, job fairs are also a great way to network and share with other job seekers. 21) Join a job search support group – can be related to your profession or not; one of the goals is for everyone to look out for leads for everyone else. 22) Start a job search support group – if there already isn’t one in your area. Share tips, assign tasks and meet regularly to compare, discuss & repeat. 23) Local industry events and seminars – network with attendees, and stand out by asking smart questions from the audience while mentioning that you’re available. 24) Management and leadership events and seminars – a good place to improve your skills while also meeting people who have the power to hire you. 25) Volunteering – help the local chapter of the main association for your profession. This will give you a chance to stay on top of industry trends, and find out early which companies are about to start hiring. 26) Volunteering for sponsored charity events – is your targeted company sponsoring a charitable event? Offer to help out. A great way to meet & impress their employees, who might include your next boss. 27) Professional associations – before you volunteer for one, join one. The more active you are, the more likely other members will appreciate the value you could bring their companies. 28) Trade unions – if your profession requires you being part of one, check to see what additional services there are for unemployed members, including refresher/retraining courses and yes, placement too. 29) Chambers of Commerce – learn about companies that are just get started, and likely to hire. 30) Work-related discussion forums and Q & A websites – look for managers asking non-trivial, difficult questions that would typically be delegated to employees, and try to understand if they need someone to delegate it to. Impressing them with your answers is a great introduction. 31) Target specific companies – network with current and former suppliers, clients and employees to learn about who you need to talk to on the inside and hopefully, get a direct referral. 32) Look for companies that have employee referral programs – these companies reward employees for bringing in new hires, increasing your chances of being referred since the employees also stand to benefit. 33) Anticipate vacancies – as you research a targeted company, take notice- is anyone close to retirement? Are any ex-employees very recent i.e. they quit or were fired? 34) Hiring freezes – research which companies currently have hiring freezes and start networking with them so that you’ll be well-placed when the hiring freeze ends. 35) Follow industry news – many things can impact local hiring trends such as natural disasters somewhere else, local discoveries of new natural resources, law changes, etc. Look for which companies are most likely to be affected or anticipate which ones will be. 36) Follow company news – look for companies that were recently funded, are expanding, relocating to your area, preparing to change direction and do anything that would require new people and their skills. 37) Use Google News Search – to find recent news about such companies locally. 39) Use Google Alerts – to be notified when there is news about such companies locally. Be sure to choose ‘News’ as the ‘Type’. 40) Use regular Google Search – to look for email addresses of the format ‘@companyname.com’. 41) Use people search engines – once you have a contact name, use one of the many people search engines to learn about them and get direct contact information. 42) Use job boards as trend trackers – job boards can show if a company is expanding, but just because your exact position isn’t mentioned doesn’t mean they’re not hiring for it, just that they’re not advertising for it. Use the board to help decide who you should be targeting. 43) ExecThread (senior-level job seekers) – “a crowdsourced platform that enables executives to be in the know about the best career opportunities around the world,” ExecThread encourages current and past execs to share hidden job leads in order to get hidden job leads in return. 44) Search employer hiring histories – The State of California's Employment Development Department website lets you search for local employers by county and occupation, both present AND past. You can quickly use it to find local companies who have or used to have someone in the role you're looking for, and if it's the latter, perhaps their hiring? If you don't live in California, search for similar tools in your area. 45) Information Interviews – never set them up looking for a job offer, but if the interviewee knows of openings, who are you to refuse? 46) Go door-to-door – once you have a small list of local companies who might need your skills, visit them with your resume. Making a good impression could lead to an interview there, or if they’re not looking, at a client or business partner who is. 47) Cold calling – prepare a 30-60 second elevator pitch. Then, pick up the phone and call at least 10 managers who might need you. Build credibility by opening with an explanation of how you discovered them, then give them the pitch and ask if they need anyone with your skills or know someone who might. 49) Targeted mailings – send a letter of introduction & your resume to a specific non-HR manager who could likely use your skills in the future, or even right now. An impressive resume could get you invited to an interview just so the manager knows what his/her immediate options are. Tempt managers that are unhappy with their employees. Tell them when you will follow up with a phone call to gauge their interest. 51) Fax it in – as everyone has moved most business activity online, every office still keeps a trusty fax machine. Use it to distinguish your cover letter and resume for everyone else’s. 52) Springboard off of an entry-level job – open your eyes to Help Wanted posters appearing in store windows. Use those jobs to learn about a new industry, a new town you’ve just moved into or even as a way to start climbing a corporate ladder by ‘getting your hands dirty’ first. 53) Consider adjacent positions – every profession has related jobs that can require as little as a different perspective. Accountants and lawyers might be able to manage businesses, programmers might be able to teach, etc., and you can always use the adjacent position to network towards your true profession. 54) Design a job – by effectively studying a company, contact the appropriate manager to propose creating a position that would a) fill a need and b) generate more than enough revenue to pay for itself. 55) Combine positions – if a company has two part-time openings you are qualified for, propose making that into one full-time position and explain how you would make it work. 56) Freelancer-to-employee – freelance your way to a full-time job for a manager who doesn’t want to suddenly lose you to another client. 57) Temp-to-permanent – work a temp job into a permanent position. For example, mothers don’t always return from maternity leave. 58) Build your personal brand – creating a strong personal brand makes you memorable and easy to find when a manager needs someone just like you. 59) Contact all your contacts, again – once a month, ping your network to remind them that you’re still available. 60) Test, track & repeat – this article contains a lot of tips and it would take a lot of effort to try them all. Begin with the tips that seem most likely to work, and track your progress. If some work and others don’t, repeat the former, drop the latter, and introduce other tips into your hidden job search. 61) Use someone else's contacts – as Gideon Vos suggests in the comments, leverage someone else's contacts too: family, friends, etc. Have you ever found a job in the hidden job market? Which tactic worked for you? Tell us in the comments. 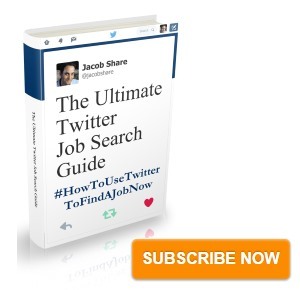 Subscribe to JobMob via email and follow me on Twitter for more ideas on finding hidden jobs. This is fantastic, Jacob. In a world where all of us career folk are raving about social media on our social media blogs, you bring us back to what may matter more than ever at times. Rich- thanks. 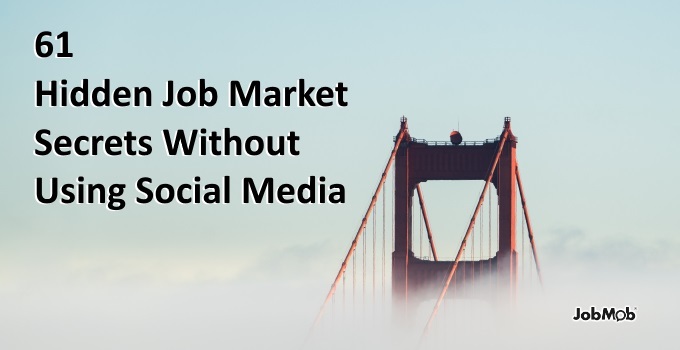 Not to disparage social media, but sometimes we forget that people were job seeking successfully before it came along, and there are still many people who have no clue what it is or how to use it. Or worse- they think they know what it is – exposing yourself in public – and specifically DO NOT want to use it. Tahl- much thanks for the insights. I’ve also seen too many emails with everyone in copy, good call. Great post! I definitely believe that face-to-face interaction is the best way to network and find a job. This is a wonderful list, Jacob! And it is so true. People give jobs to people, not to profiles on a computer. I just had a client who used #2 very successfully — my client’s boss got a job at a different company, he stayed in touch with her, she called him to tell him about an opening with her, he interviewed on Monday, and had a job offer on Friday. The suggestions here work. Hi Jacob, your article is really great! I really loved it. You are right, and I agree. 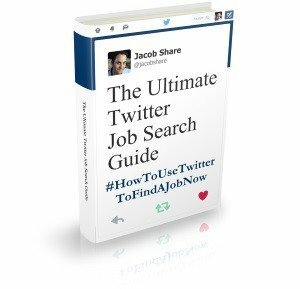 This is very helpful especially in my case that is going to look for a job in Israel. No excuses not to be working if one is constantly turning over all these stones! Sometimes, it is the easiest things that are the hardest. Your post is a wonderful reminder that our next job might be right in front of us! Melissa- that tip has worked for me personally too. Thanks for sharing. Great post! I have received more of the letters on how NOT to approach companies over the last several months as the job market continues to stress job seekers out. 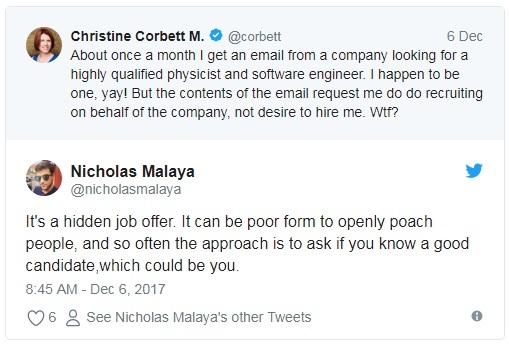 They will even go so far as to email the Vice Chair and CEO of the company with their thoughts and feelings about how bad our hiring decision process is. effective 30 or so second elevator speech. It should have three main components: Who are you? I have heard somewhere that 90% of jobs are found offline, yet today’s job seekers (or at least me last time I was job hunting!) do the majority of their hunting online. Great suggestions. Whether jobs are advertised or not, you are more likely to get it if you have a good connection with someone. This is not a bad thing. Good personality skills are transferable to every situation. I suppose my question now is whether or not I can deal with a company that doesn’t use social media. These are the very essential and high valuable information for job seekers.